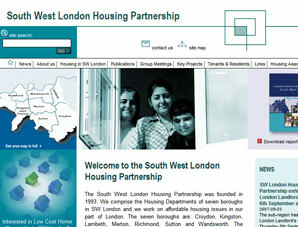 The South West London Housing Partnership was founded in 1993 to provide services to seven SW London boroughs: Croydon, Kingston, Lambeth, Merton, Richmond, Sutton and Wandsworth. This comprehensive website provides not only information to public but also allows access to meeting papers, publications and key dates in organisations calendar. SWLHP website has been developed to meet accessibility standards and optimised for search engines, using directories structure & valid HTML/CSS code.